Reversed: Overactive imagination, unrealistic, jealous, moody. In the Knight of Cups, a knight rides on a white horse and holds out a golden cup as if he bears a message from the heart. Over his armour, the knight wears a cloak covered with images of fish, the symbol of water, consciousness and creativity. His helmet and boots are winged, a symbol of an active and creative imagination and an appreciation for beautiful things. Unlike the Knight of Wands or the Knight of Swords, the horse in the Knight of Cups is not charging forward but instead moves slowly and gracefully, giving an air of calmness and peace. The horse represents power, energy and drive and the colour white is a symbol of purity, spirituality and light. The background is mostly barren, except for some trees far away and the river that flows through, symbolising the power of the emotions and imagination to create a new life force, even where it may seem that there is none. The Knight of Cups is the classic romantic of the Tarot deck. He is in touch with his intuition and emotions, and he uses them masterfully to charm and attract others. He shows compassion and understanding towards others because he has learned to understand his own feelings and emotions. The Knight is kind, caring and very in touch with his feminine side. He might be found writing a romantic poem to his lover, creating art inspired by his innermost feelings or appreciating a vibrant sunset with a glass of champagne in his hand. His heart is wide open, and he wears it on his sleeve. He shares his love freely with others, without constraint or worry; he is in love with love itself. When the Knight of Cups appears in a Tarot reading, you thrive on all things beautiful and are inspired by the many creative outlets available to you. While the Page of Cups was inspired by an imaginative idea, the Knight of Cups is motivated by action. You have dreamed about what it is you want to create and now are moving forward with this dream to make it a reality. It may be an art project or something you feel ‘called’ to do, based on your emotions, imagination and intuition. Be open to exploring your passions and your big ideas. You may find yourself drawn to a particular passion or hobby and now is the time to turn it into ‘something.’ While you are in no hurry to reach the finish line, keep in mind that true imagination feeds on action; if you do nothing with your dreams, they will remain just that – dreams and not reality. All Knights are on a mission, and this Knight’s is humanitarianism, romance, altruism, compassion, and beauty. You have a vision of harmony and are ready to bring it into reality. You are lead by your heart and want to see peace for everyone involved. When it comes to making decisions, the Knight of Cups is ruled by his emotions and his heart. When this card arrives in a Tarot reading, you are making decisions based on how you feel about a situation rather than what you think, even if others can’t make sense of what you are doing and why, and your intuition guides you in everything you do. When the reversed Knight of Cups appears in a Tarot reading, a creative project is emerging, but you are not ready to act on it just yet. You may spend most of your time dreaming up what is possible or how wonderful it will be when it comes to fruition. While it can be enriching to be in the dreamy, ideas phase for a while, the plan will not come into being until you take action. You may need to ground your ideas into reality. Figure out how much it will cost, how much time it will take, what resources you will need, and so on. This will give your project more weight so you can move forward with implementing your idea. At times, the reversed Knight of Cups can indicate that you are sulky, moody, and jealous. You may feel frustrated that you are not being given the opportunity to dream and create. You allow your emotions to get the better of you if you are not getting your way. 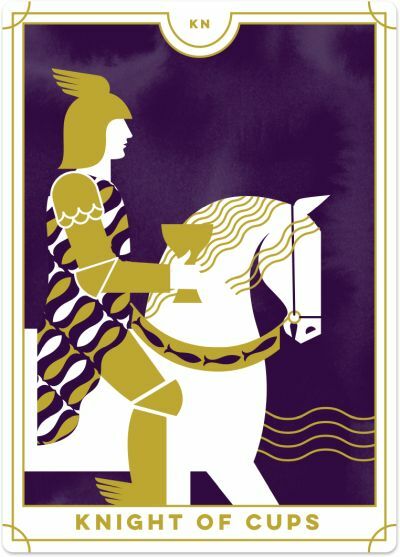 The Knight of Cups reversed can describe someone who has an overly romantic approach to life and is disconnected from reality. You may experience a level of disillusionment that an offer is not quite what you expected it to be because you have found yourself caught up in the excitement or emotion of a situation. For example, you might quit your office job so you can work at home, only to realise you miss the social contact with your co-workers. Or you might sell your house to travel the country, only to find that your campervan needs a whole new engine on Day Two of your journey. ● I am online now!